Seriously, let's have Fun! Stuff to look forward to. This A Graceful Death and Sounding for the Soul event is dedicated to the memory of Julia Wilson, who died on the 9 August, of Motor Neurone Disease. Julia's portrait is on the poster above. She was a wonderful teacher and a bright and loving soul. It was lovely to meet her and to be with her in her final stage on this earth. I am very grateful to the Bognor Regis Lions who have supported us with the donation of their very wonderful venue, the Roland Rank Centre here in Bognor. The Roland Rank Centre is a converted barn, with light, and wood, and space, and a huge friendly central hall with a fully equipped kitchen at the far end. A small but generally relevant digression now follows. "The school is registered as "efficient" by the Board of Education. Last inspection 1931." Damned, it seems, with faint praise. And very deep and meaningful that now Sarah Weller will be banging her Sounding for the Soul gongs in the plush and spacious Roland Rank Centre on the 14 September. Back now to the excellent and more than efficient Roland Rank Centre on the fancy Aldwick Road in Bognor Regis. It will host the four new and as yet unexhibited AGD paintings beautifully, and will be very resonant for the Sounding for the Soul sound works and sound bath. The kitchen at the other end is essential, because we will be giving you tea and cakes on arrival and especially after the Sound Bath, to gently bring you back to earth and help you go home not only healed and inspired, but full. So. What to expect on Saturday 14 September when you come to our event? Briefly, this is the menu. Arrive at 1pm, Sarah and I will meet you all and you will be able to have a look at the new A Graceful Death paintings amongst the older ones, and see the new poetry that has been donated. Sarah's crystal bowls, her singing bowls, her gongs and her drums and percussion instruments will all be set up for you to see, ask her about, and to form some idea of how the sounds will work in the converted barn of the Roland Rank Centre. Help yourself to cake and tea, wander around, and read what is there, see what is there and introduce yourselves to the Sounding for the Soul equipment and the paintings. Tallk to us, talk to each other, have more tea. 2pm I will tell you about the work that I do. 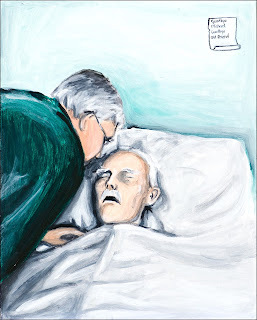 I will introduce you to the people behind the paintings, (not literally), and speak of the effect that painting people who are dying has on me, on them, and on the public that sees the pictures. Dying is a normal human activity. It is filled with fear and the unknown, and it does us good to look at it, discuss it, and see that people who are dying, can be wonderful teachers and role models. But we don't often get to see them. This is where A Graceful Death steps in. I would like to hear your experiences too. 3.15 I hand you over to Sarah. Sarah will introduce her instruments and talk to you of the power of sound and vibration in healing. She works with people with Alzheimers, and has held workshops for sufferers of Multiple Sclerosis. Sarah does sounding work for everyone that comes to her, and is highly trained in her field, and has made a study of the effects of sound and healing. She will then ask you to lie, or sit, (bring a cushion or a blanket for this part - Sarah will have plenty herself if you don't want to bring one) and relax. She will guide you to do some deep breathing, and then will start what is called a Sound Bath. This can last up to an hour, and you experience the most amazing sensations of sound and vibration. After this, you will need to drink water which will be provided. You will also need time to come back to the present, the effect is very much like a deep meditation. Then, a cup of tea or coffee and some more cake. That will also be provided, of course. I hope there will be a bit of time to chat, and to discuss how we are all feeling. At 5.30 you will go home and rest and may even dream differently that night. The £15 that you are paying for this afternoon of awareness and experience, goes directly to the A Graceful Death project. This enables the work it does with the dying and the bereaved to continue. And so many thanks to you all for coming. Jackie with her hair, having her chemo at the Queen Alexandra Hospital in Portsmouth. A party in the Walnut Tree Pub here in Bognor Regis. Why? You ask. Do you remember that the fourth and final painting for AGD this year is of the beautiful and articulate Claire? (It will be shown with the other three on Saturday 14 Sep). 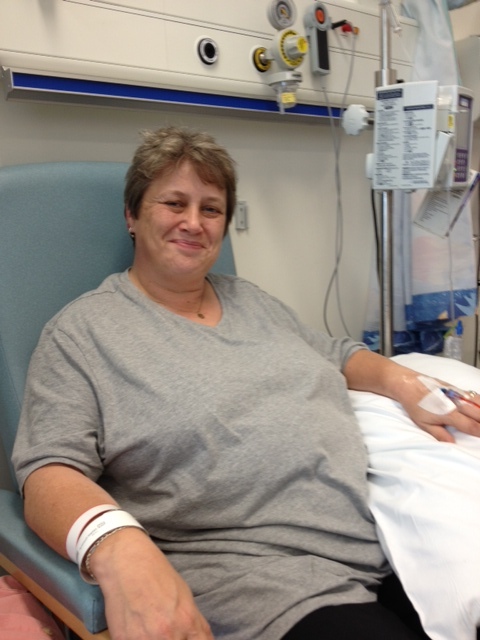 Claire's close and dear friend, Jackie, who looked after her so tirelessly when she was ill with her cancer, has now been diagnosed with cancer herself. Jackie's cancer is being treated. She is receiving chemotherapy and has decided to have a sponsored head shaving party to raise money for AGD and the awareness raising of end of life issues. And so! Jackie is a party girl, a girl who likes a good evening out with friends and family, and Jackie has suggested making an evening of fun and games at the Walnut Tree pub (who have agreed happily, to host this event), and so that is coming up. We chose a date before Jackie's hair will fall out anyway, with her chemo, and it will be the 20 September. We aim to have an evening of events, including the head shaving by a local young hairdresser, and a pub quiz. If anyone out there has any good ideas about fun fund raising things we could do that evening, let me know. What we have in mind is a great evening out, with fun and games, despite a very serious message which is, dying is natural and we need to see it and talk about it. I will get this up and running by next week, and thank you Jackie for being such a star. Have a Reggae Evening as a fund raiser for AGD? I love Reggae, and I am a bit of a groover, I think it is a very good idea. Wouldn't it be nice to have it in Jamaica? But no, Bognor will have to do. Watch this space. I feel an evening with all the old favourites coming up. And since a lot of them are dead, it fits in nicely with AGD. Like, Bob Marley, Gregory Isaacs, Sugar Minott. It's all becoming very exciting. It is true, that until we are dead, we are very much alive. And now, without further ado, I shall lie in the sun in my garden listening to Misty in Roots, and planning our very own Bognor AGD Sunsplash with the ghostly echoes of the Holyrood Hooligans laughing and jamming and mashing up the style in the ether around me. Here we are. Late on a Sunday afternoon, and I have not wanted to do the blog this week because I simply have nothing to say. With a little analysis, what I mean is I don't want to say anything. Ah. Let's have a look at this. There have been many changes in my little world over the last few months. As a relentless optimist, I like to dwell on the positives and that, of course, is just wonderful. What I don't do easily, is acknowledge the negatives and the difficulties that go along with all the changes. One of my brothers said today that I have had a hard life. This usually makes me very nervous and I deny it at once even though I have long suspected that all of my brothers think this. I fear that to have had a hard life I must be suspect, dreary and tedious company. This time, however, I agreed with him about the hard life. (Not about being suspect, dreary and tedious. I will have to be held over the Grand Canyon by my toes to admit that.) (It is wrong, anyway, so don't even think about booking tickets to Arizona, because I won't go.) It has been too, a very good life, and I am glad that I have as much in it as I do. It has also been eventful, and I have learned and experienced a great deal, and am glad and grateful to do the things that I do. Without having suffered loss and great pain, I would never have chosen to work as an artist with those at the end of life for the A Graceful Death exhibition. What my life is not, however, is easy.`Fun, eventful, challenging and full, yes. But easy, no. One of the things that a parent dreads most is the loss of their child. I have three children, and all of them are alive. One of my children is not well though, and has fallen into a black hole of a life that takes him away from me, especially away from me, for however long, if ever, it takes for him to find his way out. I am dealing with the decision I have made to keep myself away from him too, so that I feel protected from his choices. There are so many things that this child, no longer a teenager and legally an adult, is facing. I cannot imagine the pit inside him that drains all the light and life from him, and fuels his powerful rage and terrifying instability. My child is not dead, he is alive, and I face a battle to keep myself going in spite of drawing a line in the sand with all the madness surrounding him. This is hard. I don't want to have to think about it. I don't want to face up to it, and I don't find being tough and assertive easy. But there is no other way. Where is my boy? I remember the games we used to play with toy dinosaurs. I remember the complicated buildings he would make with old video cassette boxes, reaching to almost taller than him. I remember him filling them with toy animals and furniture, and making magical new worlds in which he and his younger brother could play. I remember not being able to put him down as a baby, as he would cry for hours, and hours, and hours, and so I would go about my daily business with him strapped to me in a baby harness. Even at night, he was strapped to me, so that I could get some sleep. My boy, this difficult little angel, is stepping into darkness as an adult, and may not be able to step out again. He may not choose to step out again. Whatever he is taking, whatever he is doing, seems to numb whatever demons there are in his head that misinform him of his place in this world. This, today, is the thing that I don't want to deal with, and this, today, is the thing that I am dealing with. I am new to this. I have a friend who has had to do it for one of her children, and I watched her as she was coming to terms with having to make this choice. It was the only way, she said. It was vital to do this for the rest of the family, it was vital to tell this child, who was an adult too but in her eyes, always her child, it was vital to make a stand and to say, "No. You will not destroy us too. We love you, and we are here, but you must go this way on your own." I hoped at the time, that I would not have to do this, but I always had a dreadful feeling that I would. Every week now, I join a group of people who are going through the same thing as I am. Every week, we speak and listen to each other in the presence of two trained and experienced counsellors in this area. I am not alone. I believed that my son was more damaged and damaging than anyone could ever imagine, but at these meetings I hear about other children who are just the same, and some who are a great deal worse. The thing is, we love our children. But in order to deal with the pain and trauma of their decisions and behaviours, we have to make a stand. If our children want help, if our children really want to change, then they must make the first move, and we will do whatever we can to support that. But in the meantime, we feel afraid, vulnerable, responsible and haunted. So we speak to each other every week, and find that we are not alone, and that we are not to blame, and that we are doing the very best we can but that we must not play the game that has kept us for so long isolated, frightened and aiding and abetting our children's behaviours. The strange thing is, that my house is full of light and peace now. My work is going better than ever, and I am healthier than I have been in a while. I am making a conscious decision to lose weight and to regain control over my life, and I am having friends and family to stay when before, it was impossible. I am often afraid, but feeling strong. The quiet moments during the nights are the worst, when I dream of terrifying journeys up mountains in the dark, with violent storms making movement impossible and deadly. But then, the days are full of other people and other things, and often, answers to questions that I can't answer at night become apparent during the day, and I am relieved. We shall end on a good note. My mother today said that as a family - and my family is vast, covering many continents - we do not like what is happening, but as a member of our family, this child is loved and we shall not give up on him. And I remain not suspect, tedious and dreary. I remain sparking, bright and jolly. So put the phone down, I am not going to Arizona. The brighter the light the darker the shadow. Life goes on. And a new AGD Event with Sound and Art. Life goes on. I left you last week with an account of Julia's death, and the sadness in her house at her loss. I took a couple of days off to be slow and to be reflective, and then, because life really does go on, I went back into the studio and took up where I had left off. It has been a gentle week, meeting with people that do not tax me, and with painting work that means that I spend time alone. And now, a week later, I have events to plan, things to tell you about, and a painting to do. I have started to paint Claire for AGD. I met Claire in the hospice, where she was terribly ill with cancer. When I first saw her, Claire had no hair, her body was ravaged and too thin, and she could not say much. She did not look as if she had the strength to live. On arriving at the hospice one day, Claire was no longer there. She had gone home, and I expected that she had done so to die. Imagine my surprise, months later, to find someone tap me on the shoulder at Tescos last Christmas, and tell me that they just wanted to say hello. I saw a slender, beautifully dressed and elegant woman with soft wavy hair, and masses of it. I thought to myself, I know those eyes, who is this? It was Claire. "From the hospice!" she said and I was stunned. Claire! From the hospice! Alive and well and shopping in Tescos. Claire did not die, not at all, and with the devoted help of the staff there, and of her close friend Jackie, Claire is well and is living each day now, a day at a time, with all the power and understanding of what living for the moment means. Claire is my last portrait this year for AGD. 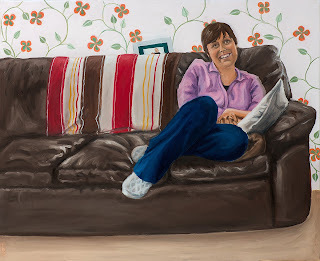 I will have painted four people when she is completed - Mike, with MND, Julia with MND (who died last Friday), Kate Granger with cancer and Claire, who has no cancer today. Her cancer is gone, and day by day, it stays away. I shall make her as enigmatic and as beautiful as she is. The most important thing is that she is alive against the odds, and is filled with an understanding of what it means to live. She has stood with one foot in death and one foot in life. Claire has gone further than most of us into death, and has a way of articulating her thoughts and experiences that makes me think I understand the paradoxes and strangeness of being in those places. The painting will show a beautiful lady, but a vulnerable one. Having said that, whenever I think I know what I am going to paint, and how, whatever forces that help me to paint at all, do their own thing, and something else entirely happens. I have also prepared a large piece of wood for a painting that I have thought about for a long time. It will be called The True Fairy, and will be a painting of me. From the moment that I could form a thought in my head, I believed that I was a fairy. As a little girl, I was terribly set upon by other girls in the playground at school, who told me that I was not a fairy at all. And that they were. "All girls," they said, "born in 1958 or 1959 were fairies." Any other years, no. "Except perhaps, for 1961." It was well known that I was born in 1960, as I was the youngest in the year. After a dreadful time trying to talk to the Fairy Queen, called Esmerelda, who lived in a tree outside the games shed, and ask her to make me a fairy, I had a moment of insight. "I am," I realised one long, long lunch break after a week of long, long lunch breaks, where I had tried to lure a response from Esmerelda with a bit of bubble gum and was continuing to get absolute silence from her, "I am the true fairy!" And that was that. Esmerelda could take a running jump. As a Fairy Queen she needed to retake all her exams and suffer a drastic drop in salary. And as for the other girls, the only reason they thought that they were fairies was because they believed in Esmerelda. I knew for a fact that blinking Esmerelda spent most of her time ignoring people from up that tree outside the games shed, because she was useless, fat and spotty and probably scared of me because my fairyness was so dazzling that it had given her a heart attack. "Ha!" I said to the other girls. "Esmerelda says I am the Fairy Queen now and you are to give me all your bubble gum." That, I thought, will show them. And it did. They were rather stunned, and left me alone and I carried on trying to fly and do magic quite happily without any distractions. The True Fairy. Aged 12 months and meaning business. And now, aged 53, I think it is time to make something of this. "I am," I will say to anyone who asks, "still the true fairy" and I will take all reactions and any, to be those of approval and joy. Time to introduce the next AGD event. Time to get the diaries out and to scrabble excitedly for a pen. This event is in conjunction with Sarah Weller of Sounding for the Soul sound therapies. Some of you have been at our last workshop together, and the feedback was excellent. It promises to be a fabulous afternoon, and Sarah is becoming very well known for her amazing sound work and sound baths. Please come to this event and support the work that we do with those at the end of life, and with promoting awareness of end of life matters. Goodbye Michael Goodbye Old Friend. 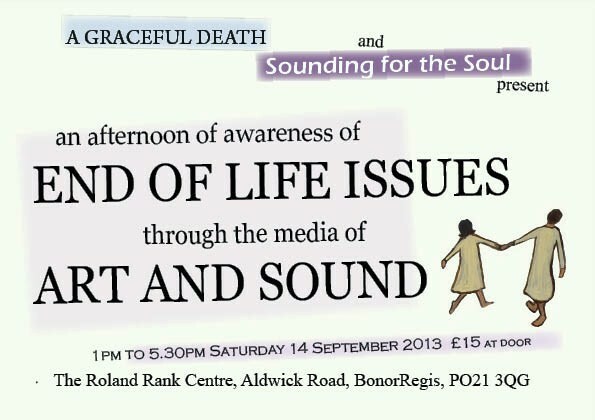 An afternoon of awareness of end of life issues through the media of art and sound. 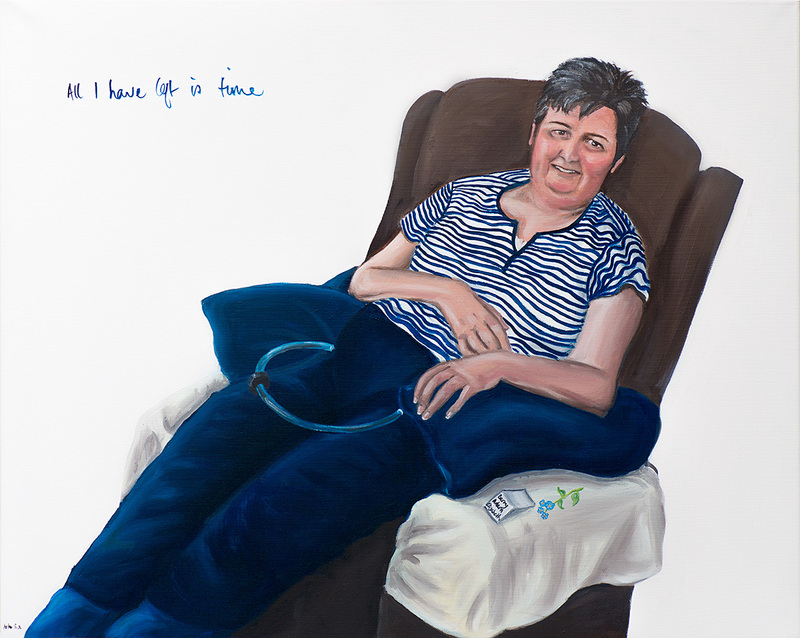 A Graceful Death, by Antonia Rolls, is an exhibition of portraits of those who are facing the end of life. In working with someone who faces their own death, Antonia asks her sitters, “Who are you? And what do you want to say?” Antonia’s work is very much with the living; until we are dead, we are very much alive and it is this life that the exhibition addresses as people come to terms with death. The A Graceful Death exhibition tours the country promoting discussions and conversations on what it means to face the end of life. Antonia will be talking about her work and the people behind the portraits, what dying means to them, and how we all have to face death. Many of the paintings will be on show. Sounding for the Soul is run by Sound Therapist Sarah Weller. Sarah uses the energy of sound and vibration to heal and sooth, and works with those who are in need of the powerful and timeless magic of crystal and Tibetan bowls, drums and with gongs. Sarah has worked with Alzheimer’s and with Multiple Sclerosis patients, as well as all her regular clients who benefit from the healing effects of her work. 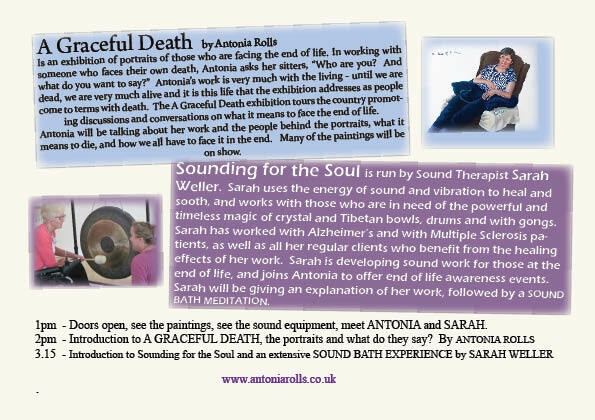 Sarah is developing sound work for those at the end of life, and joins Antonia to offer end of life awareness events. Sarah will be giving an explanation of her work, followed by a Sound Bath Meditation. 1 pm Doors open, see the paintings, see the sound equipment, meet Antonia and Sarah. 4.30 – 5.30 tea, cakes, discussions and chats. Tickets on the door £15.00. All proceeds to the A Graceful Death project. Julia Wilson, with thanks and love. The first day of eternity for Julia and the look of true love. 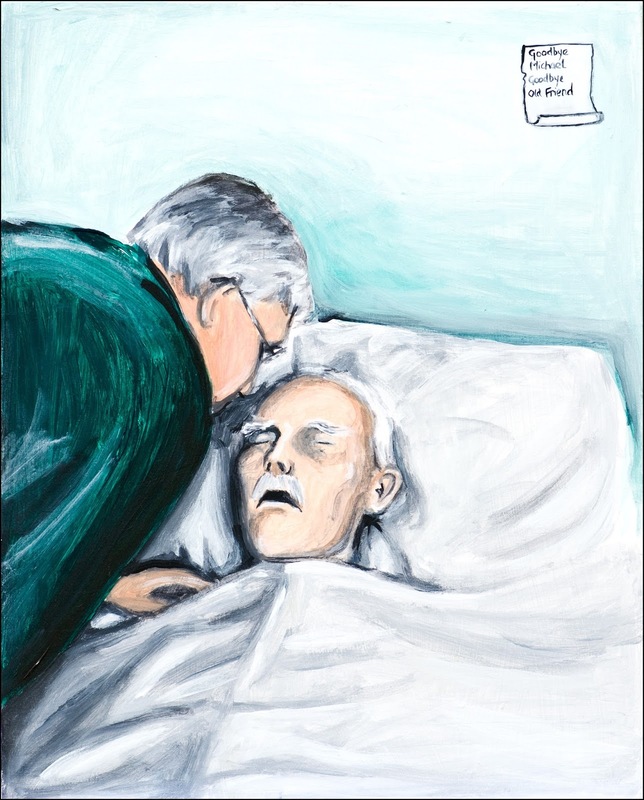 Today is the first full day of eternity for Julia with Motor Neurone Disease, who I painted and interviewed for the A Graceful Death project just a few months ago. Julia died yesterday at 6pm, and just as she died, she opened her eyes and looked at her husband. It seems to me that if ever Julia gave a gift, it was at that moment, to open her eyes and look directly at her distraught husband. When I spoke to Julia's husband, Barry, on the Thursday, he told me that there was very little time left. "I thought she had gone last night," he said, his voice breaking. The MND had rapidly become worse and Julia had become unconscious and unresponsive within days, and no longer left her bed. Barry spoke of how he was watching over her day and night, with the help of carers and Macmillan nurses, he did not want to leave her, he did not want to let her down, and he did not want to lose her. When we finished talking, I was terribly agitated, I couldn't settle to anything, I felt that I needed to go now, right now, and be there. But I couldn't, I had made plans for Friday, and Julia was well taken care of. I had promised to come back and see her in August, and now, unless I left right now, I felt, I would be too late. In the studio, I had been refreshing Julia's portrait (with so much showing, the paintings get scuffed, and need to be touched up and renewed every now and then) and so I went to speak to it. "Julia," I said, "please hold on until tomorrow. Please wait until I can see you. Please let me say thank you and let me tell you how important you have been, and are, for me and for AGD." And I had to leave it at that. But I was very moved by the news, and found myself tearful and distracted. I had formed such a liking for Julia, she moved me deeply. She was the most normal person you could hope to meet, she had no huge ambitions, she did not need lots of fuss and attention. She was a mother, a wife and a friend. She wanted love, friendship, a happy and contented family. Julia had beautiful skin, huge expressive eyes and a wonderful ready smile. Somehow, she had been chosen by life to get Motor Neurone Disease. Somehow, Julia who was married to a modest, kind and loving husband, had two very loved children, who didn't ask for much, somehow this Julia was selected by fate, to contract MND and to become imprisoned within her body as it shut down, and within a year and a half, to die upstairs in her bedroom, leaving an utterly distraught family for whom she was everything. Julia was intelligent and honest. I asked her questions for the AGD portrait, so that people would know who she was and what was happening, and Julia was utterly straight forward. Mandy, my dear friend and Soul Midwife who worked with Julia and introduced us, asked Julia what advice she would give. "Do not do the housework," said Julia with huge difficulty, this was before her speech completely left her, "when you can play with your children." Sometimes when we spoke for the AGD project, Julia would break down and cry terribly loudly, because she could not hold her husband in her arms, and could not physically gather her children to her any more. But she told us that she needed to cry like that, not to be alarmed. She needed to let it out. Oh Julia was so strong and so wise. When she cried like that, I needed to be reassured that I had not crossed a boundary from which I could not come back. She was very firm, "No," she said, struggling with her words and her breath, "it is the truth. I need people to know this." I wished that I had known her in another time and place, I thought, we could have been friends. I think I know what she is saying, and I think I understand what she means when she tries to articulate how things are for her as she waits for her body to pack up and bit by bit, stop working. Oh I thought she was a lady far beyond me, and I was moved and grateful to have had her attention. She was, and Mandy thought so too, a profound teacher. So I left Bognor yesterday afternoon, driving the one and a half hours to Julia and Barry's house, hoping that I was not too late. At the door, Barry told me that she had only hours left. "Come up and see her," he said, "she does not respond any more at all, and her colour is going. Her breathing is erratic, and she is not expected to last long." I followed Barry upstairs to the special bed next to their double bed and saw a pale, still and unconscious Julia, breathing very irregularly and erratically. I was moved so much by her stillness. I was moved utterly by the bed next to hers that Barry had slept in when he could, when someone was able to wake him if he was needed. But I was more moved by Barry himself than anything else. He is a private, practical man, a family man, quiet and thoughtful. He has held his family together for over a year now with this enemy that has taken over his wife, watching over Julia, loving her, caring for her, waiting with her until now, and now, here was the end, the moment that they knew would come. Today, Julia would leave him forever, and the next phase of his life would begin, the next phase without her. It was so hard not to cry, seeing how brave he was, helplessly watching his wife of many years, on the very last bit of a journey that no one could stop nor help with. I stroked Julia's hair, and gently stroked her cheek. I told her how important she was and is, and thanked her for all her patience and time with me. Julia has nothing to learn from me, I have everything to learn from her. I thanked her for teaching me about strength, communication, dying, the pain of leaving a family, and the pain of not being able to tell them that she understood everything, that she knew exactly how badly her family were feeling. And that she missed them so much, sitting in her chair unable to move and then unable to talk, and then unable to respond at all. I thanked her for allowing me into this time in her life, and for making my understanding just that fraction better. I called her darling, and held her hand. It was very, very hard to do this, I just wanted to cry. But there was no time, if I cried and could not talk, there was not time to tell her these things, and so I made myself concentrate on talking. Barry came upstairs and I went downstairs, leaving them alone together, and I sat in Julia's chair in the sitting room, watching Top Gear on the TV with the sound off. "This house is waiting," I thought. "This house is waiting for Julia to die, and everything is normal but it is also far from normal. This is such a sad time and what is to be done? Waiting is to be done. That is all. Wait and watch." And I continued to watch Top Gear and wonder what they were all laughing and talking about in the silent programme on the telly. Barry came running downstairs. "I think she has gone", he said. I followed him and his son upstairs. Julia was lying completely still, her face relaxed, and with no sound of the strange breathing. And Barry said in tears, "she looked at me. She opened her eyes and looked at me." We held Julia's hands, one each side of her, and between his tears and his pain, Barry talked of her, and asked if she really was dead. It is hard to know, sometimes someone newly dead really does look as if they are asleep. Sometimes, they look as if they will take another breath, and sometimes, you think you see their chest move. But Julia had that waxen look of death, and her face had relaxed into the most peaceful expression that was not possible when she was trying to breathe a few minutes earlier. When Barry called the doctor after a little while, he was brave, courteous, he said that he thought his wife had just passed away. What a call to make. This was the first official admission that it was all over. We waited by the bedside holding Julia's hands until the doctor came. I held Barry too, which I would not have done in any other circumstance. I wanted to help him hold himself together. I wanted to let him know that another human was there, and that he was grounded and safe, and even while he was watching Julia in pain and disbelief, I wanted to give him some connection to love and warmth where words simply would not do. I was worried that if I didn't hold him, he would burst into a million atoms and be lost in the room forever. When the doctor eventually arrived, I went downstairs to make some tea. I decided then to stay next to Barry and watch over him until someone came to support him. And so I did, until some family arrived, and then I slipped away. My head was so sore on that journey home. 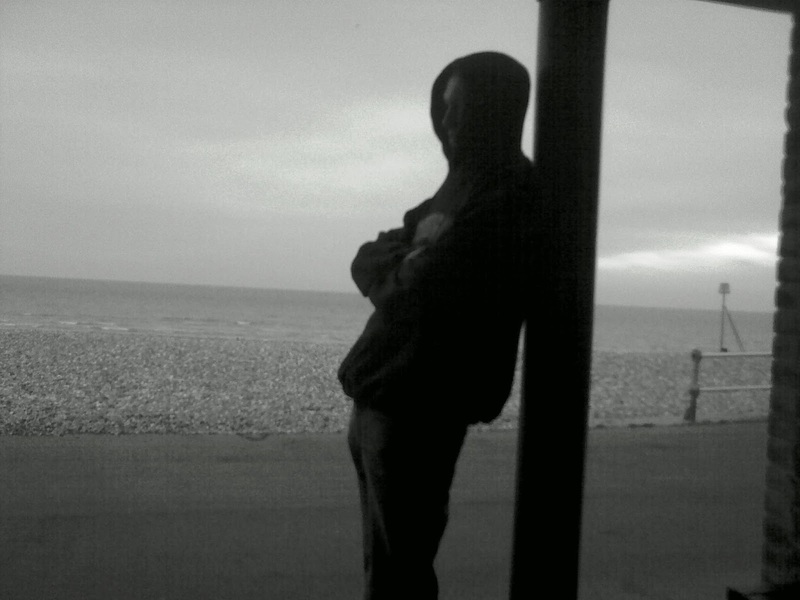 I was exhausted when I arrived in Bognor, and upset, and unsettled. I did not sleep last night, and I have been tearful today. Julia's portrait is in the studio where I left it, and she looks out at me with her lovely smile. On the 3rd of October I will be talking about AGD and the work I do, mentioning the Motor Neurone patients in particular, for the Performance in Ethics series at Brighton University Medical School. She will be a most important part of this talk, and I will make her journey worthwhile. Now, as a treasured and honourable member of the exhibition, I will make sure everyone that comes knows of her amazing inner strength and of her absolute ordinariness, which makes her one of the most profound teachers I have met. Julia, with the names of her husband Barry, her son Adam and her daughter Elizabeth on the paper by her elbow. Next to them is a forget me not flower. Julia died last night at 6pm, and as she died, she opened her eyes and looked at Barry. God bless you Julia. I will leave this account with the following thought. Last night, I spent time in a house where housework had gone by the by in recent months. The players in this house were a lady in her forties, no make up, no frills, in a coma, dribbling and unable to draw breath. And a man in his sixties, unassuming, exhausted with a year and a half of constant care and in pain with the knowledge of losing his wife. So not, as we may say, at his best. The myth that our world perpetuates that in order to be loved, you need to be thin, smart, sassy, young and rich, is blown to pieces by the love in that house last night. Here was a man who loved this lady in the coma with all his soul, and could not bear to think that he may let her down in any way. And the lady in the coma, was part of this dance. Her love for this man caused her to cry with feeling, a few months ago, that she could not hold him as she wanted to. It was to him that she looked as she died, it was this man who she, too, loved with all her soul, that she wanted to see at her very last moment. Love is a very powerful and deep thing. It is not superficial and external. It is built with shared experience, with history and knowing and it is accepting, enabling, empowering and I have seen how real, true love, looks. I am not hiding any more! I have, as they say, hidden. I am back home now, feeling so much better and telling myself to remember that these times come upon us, but they do not always last. Running away was, in this case, essential. I had planned this retreat a long time ago, in order to be very silent and to begin writing a book, but by the time I was due to leave, it had become a full scale retreat with all guns blazing from my life in Bognor Regis. I went to Hawkchurch in Devon. I went to Lizzie's cottage; Lizzie who composes the music for the A Graceful Death exhibition. Lizzie has gone on tour in the US and we arranged ages ago, that I would spend a few days there enjoying the peace and quiet, and even at the time we discussed this visit, my life was fairly stressful. By the time I was packing my bags to leave, my life here felt as if it was bludgeoning me with a mallet. It will be a small blog this week, as I am now very laid back. I have photographer extraordinaire Eileen with me, and we are working on our Bridport A Graceful Death venture in November, and then we are going to a fair here in Bognor. In the spirit of being extremely healed and smiling a lot with not only my mouth but my eyes too, from the panic of the last few weeks, in the spirit of having come back from Devon with my feathers well and truly smoothed, I shall fit this account into my plans to go to a fair, instead of fitting the fair around my plans to blog. I must thank all of you for your wonderful support and kindness around casting my wonderful and sad son into his own life without me. So many of you gave me wise and loving advice, and so many of you reassured me that we would all survive. I want to reproduce an email that my friend Stuart sent from Scotland, that helped me so much. Stuart has suffered greatly. He has lost his beautiful wife to suicide (and today, 4 August 2008, is the anniversary of last day he saw Sue before she went ahead with her plan to end her life) and as a result tumbled deeper and deeper himself into depression and alcohol. Stuart ended up going to Alcoholics Anonymous, and has turned (and is still turning) his life around, and Stuart knows a great deal about making choices and taking responsibility for your own life. Perhaps I should add that Stuart is, too, a deeply sensitive, intelligent, kind and modest man. And so, the following email means so much to me. I've just read your blog and at the risk of being patronising I feel I need to say something (patronising because probably you know it already). You have NOT taken a risk with his life - he is the one taking all the risks with his life and there is, ultimately, nothing you can do about that. It must be extremely scary for you, but you have not abandoned him. As you have said previously, you are where you always have been - a loving mother who will be there still if/when he decides to see it. Like me, however, you are not God and his life is not in your hands. I have heard so many people in AA talk about how sometimes the best thing a close one did was cut them adrift a bit because that let them hit the rock bottom they needed to reach in order to begin recovery. Without that, their loving one was helping to keep them on their destructive and selfish path. The hard thing for others is that everyone's rock bottom varies. For some it is marriage break up, for others it is years of destitution and pain, and the harsh reality is that some people don't seem to ever hit that bottom and end up killing themselves one way or another. I'm not telling you what to do Antonia - I am just trying to speak from my own experience - whatever happens to your son now, it is NOT your fault. Easy for me to say because he's not my son - but that doesn't stop it being true. As they keep saying in AA, the only person in this whole world that you CAN control, with God's help, is yourself. So, here I am telling you what to do - you look after and nurture yourself. And if/when the time comes that your son recognises and is able to accept your love, you won't be a complete wreck. Lots of love, Antonia. Take good care - of you. Thank you Stuart, and thank you all of you. For the record, Stuart and Sue feature in A Graceful Death, and Stuart features in the AGD film that Neill Blume made. Stuart and Sue look over at each other, and between them is an extract from Sue's diary, her suicide note, and a letter full of love for Stuart from their wedding day many years before. And finally, video number three. And now. Off to the fair. There is much to look forward to. I have decided to take the whole of August off, seeing myself in my mind's eye pottering bare foot from the house into the studio and back, putting more gloss on parts of the house that may need it (you may remember that I bought a job lot of brilliant white gloss paint because it was on offer, and have now quite a lot of gloss paint). I saw myself telling myself that if I wanted to stop everything and go and read a light and uncomplicated detective novel in my sitting room while the sun was shining through the window, then I was to do that. And bit by bit, I have been realising that this is not about taking just August off, it is about taking the rest of my life off. August was about removing stress and anxiety from my thinking, it was about not feeling hopeless pressure while never allowing myself time to stop and smile at the hollyhocks. And so, I am taking the whole of August off as a prelude for taking the rest of my life off. I am very excited to see how much better the work I do is, by removing the ferocious anxiety that goes with thinking that you never quite do enough, and it is never quite right, and that at any minute, someone will notice and point it out to you in a crowded place.